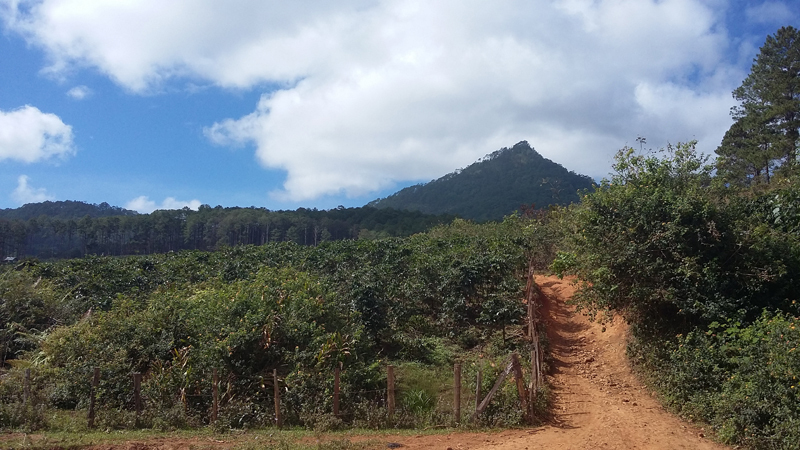 common view along the race course is trails lined by coffee plantations. Two years ago I made a drastic change in my employment and moved myself and my family to Vietnam. Of course there were a lot of changes but one of the biggest ones for me was the loss of a cycling community. Here I had months of beautiful warm weather with only myself to ride with. Occasionally I’d see one or two other guys out on the road, usually on an old steel bike with flat peddles, not the same pace I was accustomed to in Utah. When the summer months came around and I saw all the posts on Facebook from my friends in Utah about their bike races it made me anxious to get back in the peloton myself. It wasn’t until I had a chance encounter on an early morning ride off my usual route that I found other serious road cyclists. Nine months after moving here I was finally able to join my first group ride shortly followed by a road race. The first locals to pre-ride the Vietnam Victory Challenge course. 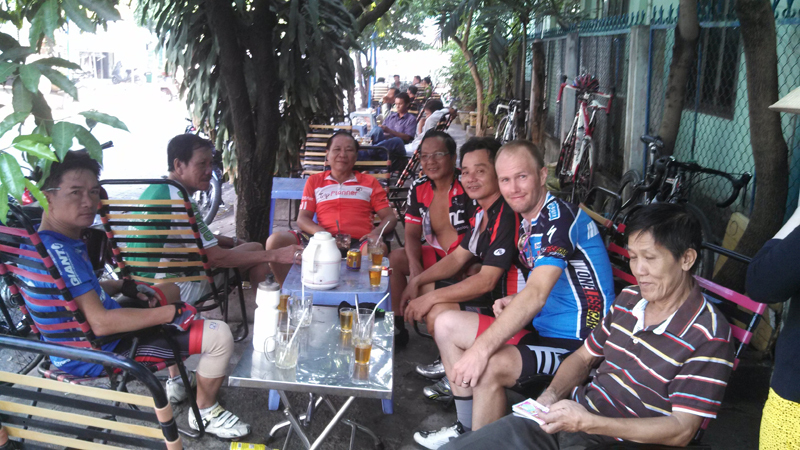 Some of the pioneers in the mountain bike scene in Vietnam. I wasn’t sure what type of competition to expect in a third-world country, even though Ho Chi Minh City is becoming much more advanced. The locals quickly showed me that they knew how to throw down and I was pleasantly surprised. Well, maybe not pleasantly since the locals made me the nail and they were the hammer. It was a breath of fresh air to be mixing it up in the peloton again with the familiar burn running through my legs and the sound of carbon wheels humming down the road. As the Vietnamese economy grows, and more individuals finally have a little bit of disposable income the cycling community is quickly growing too. Despite many of the riders green legs they can sure drive the pace and are very dedicated. Their rides are all early morning rides meeting at around 5am every day of the week. I’ve also learned that the stop at the coffee shop at the end of the ride is just as important as the ride itself. Cyclists will sit for an hour or more drinking shooting the breeze while sipping Vietnamese iced coffee and smoking cigarettes before they head home or to the office. I’ve been repeatedly outridden by riders that seem to have a cigarette in their hand at all times they’re not on their bike. Cycling shops to support these local riders have been few and far between. Local cyclists were buying used equipment from Japan online, or some even grabbing a cheap flight to Malaysia to stock up on their gear. In the short time since I’ve been here I’ve already seen two new well-equipped bike shops open in my neighborhood alone. Several other new ones have been spotted throughout the city signaling the fast growth of cycling in Vietnam. Riding bikes in Vietnam has quickly gone from a basic necessity for cheap transportation to being much more of a status symbol. I thought I brought a pretty nice bike over here with me but within the peloton it’s definitely on the cheaper end. Most riders are sporting top-of-the-line bikes from all the major makers. Bikes equipped with DI2 and UI2 and all manner of deep dish carbon wheels are the must have status symbol here. Cars in Vietnam are taxed at 100-200% depending on the model so if you make a good income, chances are that a car is still out of the question but a sick new whip is doable. for two days races around this mountain. The rapid growth and excitement around competitive riding has been exciting to watch and even more exciting to be a part of. I’ve completed multiple road races now and completed my first mountain bike race held at a park about six months ago. Due to years of off road riding experience in the Wasatch Mountains and the amazing miracle of muscle memory (it certainly wasn’t my fitness level), I was able to take the holeshot at the race start to avoid the typical bottle neck as the race funneled onto the single track section of the course. This set me on course to deliver my first race victory in a very long time. I’d rather not say how long it’s been. That performance gave me instant “street cred” to further break down barriers with local members of the cycling community. Folks here see plenty of foreigners come and go around here. Simply being a nice guy just doesn’t cut it. If you’re an outsider and you want into the cycling community you’ve got to be fast. Riding with the locals I’ve learned just how sparse their cycling calendar is. Not only are there very few official road races but mountain bike events are almost nonexistent. The racing scene, especially the mountain biking scene needs a big push. 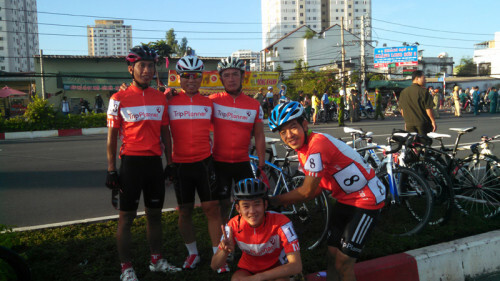 Local TripPlanner team at a local circuit race in Ho Chi Minh City. I was invited to ride with their team for this race. Central Vietnam has some amazing mountains that are littered with numerous challenging trails- both single track and open mountain roads – but the only people riding them are the local coffee farmers and local hill tribe people on their rickety old Honda Cub scooters. Exploring trails and communities in a foreign country that have likely never seen a mountain bike is an experience and a half! I never pictured myself living in Vietnam, but I sure as heck never imagined riding remote trails in the central highlands. You might just want to just hop a plane and head for the highlands in search of your mountain bike dreams. As you can imagine some areas have very real danger of unexploded ordinances. There are however some large areas such as the area surrounding the city of DaLat which were neutral areas during the war and are free from such dangers. 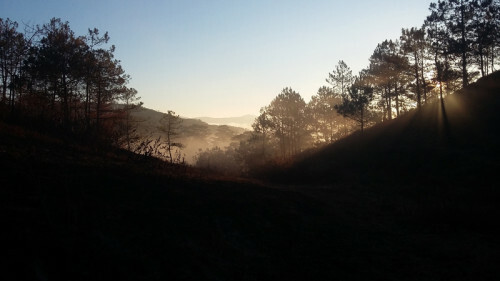 As DaLat is a relatively short distance from my new home in Ho Chi Minh City I’ve had to retreat there from time to time to cure my need for mountain air. 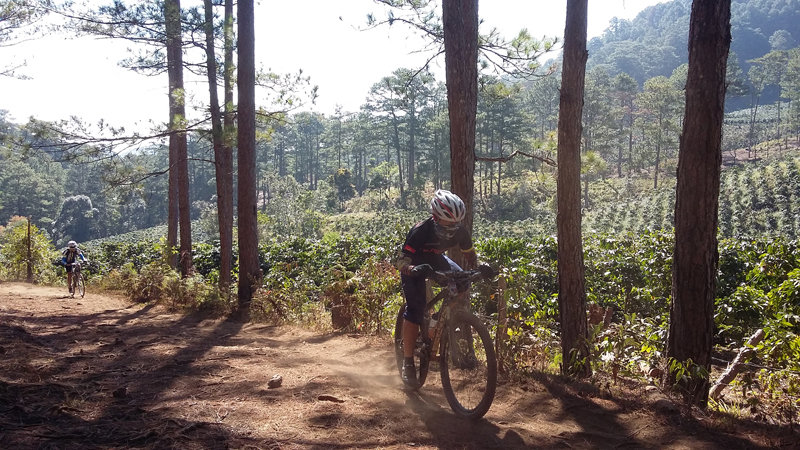 After several trips to DaLat with some major exploration and many group ride conversations – followed by the ritual coffee shop talk – myself and some Vietnamese riding buddies have created Vietnam’s first ever international open mountain bike race with full backing from the Vietnamese Cycling Federation. It’s taken a tremendous amount of work but has local riders chomping at the bit to mix it up on the dirt with foreign riders. In mid-March of 2015 we’ll be collaborating with provincial leaders, local cycling clubs, and international sponsors to run the first-ever official mountain biking stage race in Vietnam. 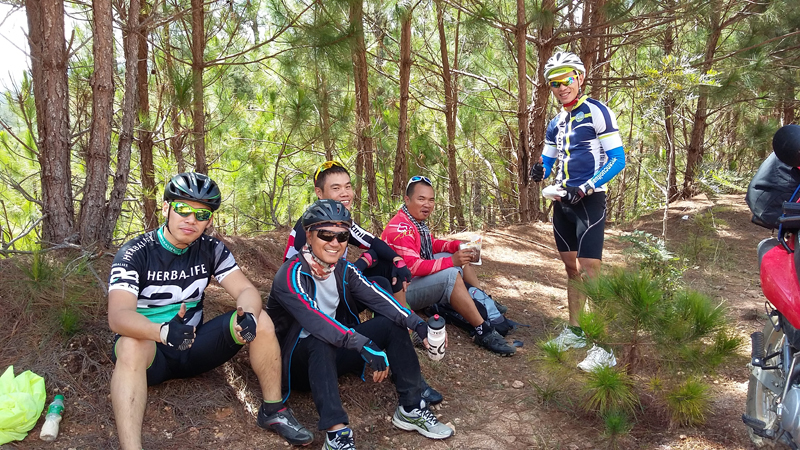 Our goal is to really highlight the world-class mountain biking available in Vietnam. And, no BLM either, just fresh trails, and quiet forests! You can keep up with our progress via our website or even grab a flight and join us yourself. 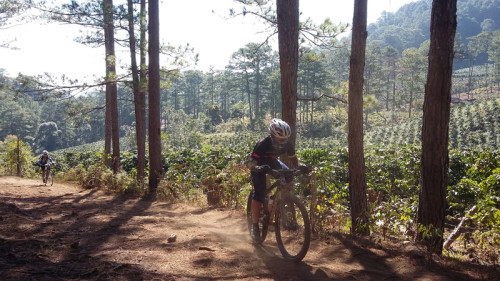 It will undoubtedly be a race that riders will never forget and hopefully will encourage more Vietnamese cyclists to hit the dirt on their local trails.